I kept on painting and they kept on arguing. Hall, D. & Wykes, P. (1990). Anecdotes of Modern Art. As Picasso told Francoise Gilot. Watch the great Picasso paint! Kirby. Great blog. Two recollections: For the past few years, I have been fortunate to attend life drawing sessions with Jim Hubbell in Julian. We all look, the classes taught me to see. Also, when I drew a particularly distorted figure, I got a glimmer of where impressionistic art cam from. The bell rang! Ahaah. Second recollection. 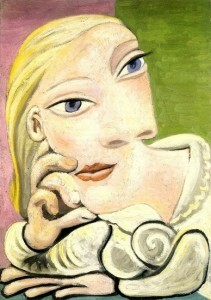 Francosie Gillot was the last of several of Picasso’s lovers. After his death, Francoise and Jonas Salks came together. Salk was the dedication speaker at the opening of the newly built San Diego Blood bank, circa 1973. I asked Salk if he would consider being the dedication speaker. His response, “first I need to meet you and know why you want me.” We met. He spoke. Wish I had met Francoise. If I ever encounter that situation I know exactly how I would handle it. Would love to know what you would do, Jordy! Who won the wrestling match? Isn’t it like a man to want his cake and eat it too? And Picasso had plenty of cake & ate it all! 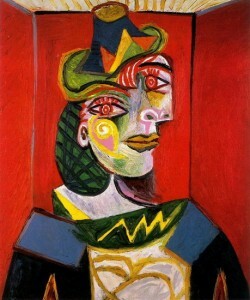 I think Picasso did what he wanted and that was what made him such a great artist. He had his own opinions, uninfluenced by others. He had that kind of courage. Thus, Marie-Therese and Dora had to make up their own minds…….Picasso had made up his mind that he liked them both. He would do the same with his art……make up his own mind about what he liked, not what the dealers or public liked. You and your blogs never fail to “make my day. . .” Miss you and Roberto. Hope to see you next week during a brief nine-day detour to America’s Finest City! How wise he was not to become involved in a problem that was not his. Oh how I wish I could draw like Picasso or any cartoonist, for example. Not paint … I’d be satisfied just to be able to draw. But alas, no such talent. I’ll have to stick to writing and playing bridge. As always, your blog is fun and invokes memories and reflections. The first art I remember seeing in the U.S. (as you recall, I grew up in Mexico) was some Picasso ceramics at the Rockhill Nelson in Kansas City in 1956. I liked his appreciation of both women for different but wise reasons. However, he really had nothing to lose, no matter what he said. Right? Moreover, I was underwhelmed by his one-dimensional drawing demonstration. I have had the pleasure of watching you compose and paint – and you have so much more to offer the art-lover in terms of technique, serious attention to detail and retrospection. What did Picasso really care about, I wonder?